I’d rather use a looper. 🙂 The premise is great: Strum a chord, or pick a note, press and hold the button, and what you just strummed is held in place. When I first saw the video, I was thinking that it would be great for my solo acoustic gigs where I could solo over the frozen chord. But after playing around with the pedal, I realized that I like soloing over live loops than just a single chord. No doubt, the pedal offers some interesting possibilities. One thing that I found was really cool was using the latch mode while playing chord progressions. In latch, freeze is always on, and each time you press the button the pedal freezes what you’re playing at the time. With chord progressions, it’s cool because it really helps fill the space, but the problem for me – and probably most players – is that I don’t do just a straight strum. I palm mute, I tap the strings, I pick out bass lines and such, and this is where it’s really tough to use this pedal. Interestingly enough, lots of bass players have picked up this pedal. For bass, it makes lots of sense because you’re mostly playing single notes at a time. But if you slap or play two- or three- note chords like my bassist does, I think the pedal would get limited usage. I’ve had mine for about a month now. I understand your critiques, and they make sense for the types of shows you mention. I use mine in a church setting to fill space between songs. 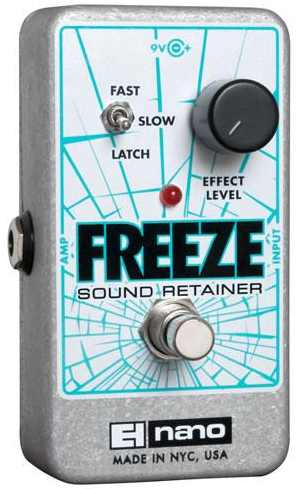 For this, the freeze is actually far more useful than a looper because of how simple it is to use. Keith, can you go into more detail on how you use it? I’d find it very instructive. It sits in front of my volume pedal and delay. Either during the “say hello to your neighbor” or near the end of a song, I’ll drop the volume pedal down, play a chord, hold it with the freeze on “latch” then swell the volume back up. I have the effect level on the freeze set before hand to provide a good pad level. I can change the chord I use on the fly, even mid song. because it runs through my delay and reverb, you get a nice sounding, rich pad that really fills space. just be sure that the effect level is low enough so that it blends in once the band starts playing. also, remember that in order to mute your guitar, you will need to use the volume knob on the guitar rather than your pedal, otherwise you will lose the pad sound.